Super Rugby 2018 was many different things to many different people. Boring-fascinating, enthralling-sleep inducing, too much-too little-enough. Predictable-unpredictable. A mess? The final result – another Crusaders victory – was predicted by many as early as February 2018. The semi-finalists were similarly predictable, even the quarterfinalists were mostly predictable. Even so, some of the happenings during the 19 rounds was a far cry from what many punters predicted. Fancied teams stumbled and stuttered, underdogs won games no one predicted, players showed or lost form, the referees had their worst year in living memory, while SANZAAR’s judiciary once again refused to apply the written laws of the game and prescribed sanctions for breaches of such laws. One thing everyone agreed on was that the reduction to 15 teams did not do much to fix the apparition that Super Rugby has become in the years since inception. Despite the change back to the 15-team format previously seen from 2011 to 2015, the fans continued to abandon the competition, straying off in multiple different directions, to the point where a gardening programme drew more watchers on Australian TV than did a local derby Super Rugby match. Super Rugby remained essentially flawed, with far too many teams, way too much travelling, and many teams well below the standard Super Rugby should demand. The fixture list remained a mysterious concoction dreamed up by some SANZAAR backroom boys who do not seem to have the vaguest idea of the stresses and strain of modern day rugby. The referees and their fellow match officials were the subject of a variety of emotions, ranging from apoplectic anger to unconcealed mirth, none of which were good for the game of rugby. The misapplication of the laws, together with a host of personal interpretations and even “homemade laws” that do not appear in any law book ever published by rugby’s governing bodies was compounded by a number of outright biased performances and frequent displays of sheer incompetence. It was simply not good enough! The dwindling spectator numbers, the vanishing television audiences, and the stagnation of the quality and innovation of southern hemisphere rugby has finally caught the attention of the member nations of SANZAAR. There is talk about reducing the competition back down to 14 teams in 2020. Unfortunately 2020 is still a long way off and the 2019 Super Rugby competition will still involve 15 teams, spanning multiple time zones, with 18 rounds of competition providing for 120 regular season games, and then 3 more rounds and 7 games that make up the quarter, semi, and final games. Another season clogged with too many games, often of little rugby merit at all, making it very difficult to find the time or motivation to pay full attention to every team and game. However, Super Rugby remains the most important competition in the Southern Hemisphere, despite the failings and weaknesses of the format and structure of the competition. And in 2019 the competition assumes some serious interest as it is the forerunner and practice-ground to the Rugby World Cup that is scheduled for Japan later in the year. Established international players, and those on the fringes of selection for their national squads, will view the Super Rugby competition as something of an extended trial for national selection. They will need to find fitness and form, and maintain those ingredients right through to the end of the World Cup. There is an awful lot at stake for the players, their teams, their coaches, and their fans in 2019. 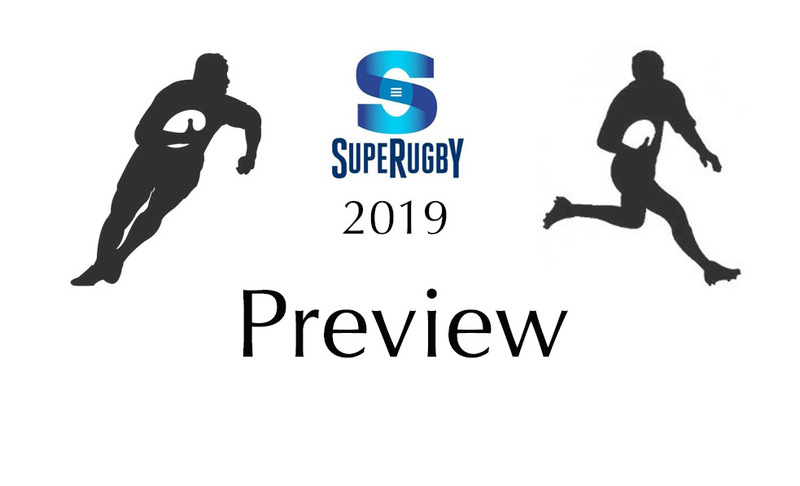 Each of the five participating countries, Argentina, Australia, New Zealand and South Africa, perhaps with Japan to a lesser extent, will be viewing the Super Rugby competition with some caution yet huge expectation. We know that all the participating countries will ensure that their most valuable international players are carefully managed with restricted appearances and exposure to ensure their freshness and fitness when the World Cup kicks off some eight months from now. The respective national coaches will already have some idea of what their 31-man World Cup squads will look like, but there are a number of factors that can, and likely will influence their final selections. Injuries are an inevitable factor, which prescribes the need for depth and back-up plans for each and every first choice player. Form is a hugely important factor too. The old saying that “form is temporary and class permanent” is very true, but a World Cup requires payers that are in form and at the top of their game. The individual players will be closely watched in this Super Rugby tournament and the shortened Rugby Championship that follows. Both established and fringe players will be very well aware how quickly things can change, and how the wind of fortune can blow up an unexpected storm..
Derby games in South Africa, New Zealand, and Australia can be brutal and bloody affairs. We can certainly expect them to be even more brutal and physical in 2019. Let’s take a quick look at the three conferences in 2019. A more detailed analysis of each of the franchises will be posted during the coming weeks. The Rebels have been slowly but steadily improving under Dave Wessels. Some important signings for 2019 include the unpredictable Quade Cooper, signed after a season in limbo after being discarded by the Reds, who did not include him in their playing squad but were forced to pay his salary as he enjoyed a season of lightweight rugby in the local leagues. Cooper replaces the departing Jack Debreczeni who has crossed the Tasman to play for the Chiefs. Other important signings include Luke Jones from Bordeaux, Isi Naisarani from the Brumbies, and Matt Toomua returning to Australia from the Leicester Tigers. 2019 may just be the Rebels best year yet. Dan McKellar’s Brumbies did not reach the finals in 2018, but wins over the Hurricanes and Bulls away from home suggest that they have something in the tank. The have signed James Slipper from the Reds, Pete Samu and Toni Pulu from New Zealand, and will look to play more running rugby in 2019. Their focus on a running game has started to bear fruit as they increased their try tally from 43 in 2017 to 56 in 2018, which is still well short of their potential. This may be the last season in the Sunwolves existence. If the rumours are true, they may find themselves dumped from the competition in 2020. This cannot be the best motivator for a team of foreign legionnaires masquerading as Japanese. The Sunwolves have recruited some heavy hitters and have built a fairly competitive core, consisting mostly of foreigners as the corporate based clubs of Japan have largely avoided getting involved in the Sunwolves and their Super Rugby campaigns. A team with no real raison d’être, they will continue to be a handful at home, while losing everything away from home. The Jaguares have long threatened to shake the Super Rugby form-book and the established hierarchy of teams, but always flattered to deceive. The core of the Argentinean national team, the Pumas, take to the field week after week as the Jaguares, and have underperformed since their initial entry into Super Rugby. Until mid-2018 this was still true. Then a startling a run of form and victories away from home, including a first ever in New Zealand, signalled that Mario Ledesma had turned the also-rans into competitors, who qualified for their first-ever finals in 2018. Sadly, they have lost the services of 50-test veteran Lenardo Senatore, while match winning flyhalf Nicolas Sanchez has headed off to France and Stade Francais, while his back-up Juan Martin Hernandez has hung up his boots. They will need to find a replacement for these two as quickly as possible. There’s also a change in the coaching department, with Mario Ledesma taking the reins at the national level hence former France assistant Gonzalo Quesada slots into the head coach role. The Jaguares 2018 home record sucked. Their 5-3 record is poor considering their advantages with regard to travelling distance for visitors from Australia and New Zealand. They did manage to beat all four of their South African rivals at home, pushing up into second in the conference. On paper the Stormers are a powerful team, loaded with Springboks and aspirant-Springboks. However, they are not a happy franchise, in an equally unhappy union. The rugby-political shenanigans of those tasked with administering the province and the team have become legend, and have bankrupted the once wealthy union. The Stormers certainly have the playing resources, but seem light in the coaching department were Robbie Fleck has failed to convince anyone of his tactical and technical nous. Financial woes have forced the team to bid farewell to a number of senior players, while being financially incapable of attracting big-name replacements. The best supported team in all of Super Rugby, their woes are likely to continue to frustrate their dedicated fans in 2019. Team to watch: All of them. Team to ignore: Perhaps the Blues, but at your peril! Any of the New Zealand franchises could write their names on the trophy in 2019. In each of the last three years the Hurricanes, the Crusaders, the Highlanders, and the Chiefs have qualified for the finals. The Hurricanes won their first-ever trophy in 2016, the Crusaders added to their cabinet with back-to-back titles in 2017 and 2018 and the Chiefs won through to the semi-finals on two occasions, just missing out in 2018. The Highlanders have also had the chance to display the trophy in their cabinet, but do have to find a replacement for their perennial match-winner Lima Sopoaga if they want another shot at that trophy. They will be looking for Bryn Gatland, Marty Banks or Josh Ioane to step up and fill his ample shoes. Ah, the Blues. In 2018 they were the only New Zealand team to lose to an Aussie team at home, crashing to the Rebels in June, and were ranked second-last, finishing above only the Sunwolves. They have the playing resources, they have a reshuffled coaching lineup, but do they have the mental strength? Do they have the mongrel? Time will tell. Blues fans won’t be holding their breath. So much for a brief look at Super Rugby 2019. We will be looking at each of the franchises individually in the coming days.